How can I paint a monarch butterfly onto a polyester wedding dress? Message: I searched, but I cannot find this information. I need to paint a 100% polyester wedding dress (for my wedding) with orange, red, and black. I bought some iDye Poly, but I cannot immerse this dress, as I need to paint a monarch butterfly onto it with the dye. I was told that iDye Poly will still work if I use less water and then paint on what I want, then use a heat gun to set it. Is that true? If not, what do you suggest? Dye-na-flow? Tee Juice markers (this may be too expensive)? Here’s my original post (No replies yet! ): Hi dye experts, I am going to dye my wedding dress (for my actual wedding) to look like the picture below left. It is 100% polyester (satin, ivory) in its current form (off the rack at David’s Bridal). To dye this dress, I bought iDye Poly in orange, red, and black. I need some advice on the best way to dye this! It would take way too many Tee Juice pens to do this the easy way (therefore, too expensive). Every video I watch and every forum I read tells me to boil water, add in iDye Poly & intensifier, then put the fabric into a pot and stir. I can’t do this! I need to hand paint the dye onto this dress to get the effect I want (butterfly wings). I plan to use a sponge or sponge on a stick or something. I could use a paint brush, but the bristles may not make for an even spread, and I do not want the color to streak (like a brush might create). I could also use make up sponges, which might be easier than these flimsy 25 cent sponge/sticks. I don’t want to burn my hands, so the temp can’t be too hot to touch, or I won’t be able to put pressure on the sponge to get a smooth, deep stroke. If you look at the dress in the Pinterest link above, it is hand-painted dye onto fabric. It happens to be 100% polyester, just like mine. I bought some test fabric (identical to my dress) and some iDye Poly. I want to do a test sometime this month (in my friend’s backyard). You cannot dye your wedding dress with iDye Poly, because you would indeed have to immerse the dress in a huge pot of boiling water with the dye in order for it to work. Even if your dress could survive such rough treatment, it will probably be impossible to find a cooking pot large enough for the fabric to move freely in it. Such a huge pot would be very expensive, anyway, especially since you should not plan to reuse a dyeing pot for food. I would not choose iDye Poly for painting onto fabric and setting with a heat gun. 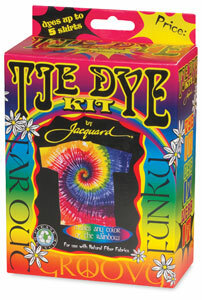 Although iDye Poly does contain the right kind of dye for polyester, which is a type of dye known as disperse dye, this is not a standard method of dye application; artists have found more success using other techniques. If you were to try such an unorthodox method of dye application, you’d need to do a lot of testing, using the same fabric as was used in the dress, to determine what combination of techniques would work, and even then there would be a strong chance that it would not work as well as you would like. By painting disperse dye directly onto the fabric and then heat-setting, you would likely have bits of unset dye resting on the surface of the fabric, which would tend to rub off onto you and anything the dress touches. This could maybe present a possible health risk, since the dyes are not intended to be applied directly to the skin, and it could ruin furniture, walls that you brush against, anything you may be carrying, and even other people’s clothing when you brush against or hug them. are disperse dye iron-on transfer crayons, not at all like the ordinary wax crayons they so closely resemble. You have two main possibilities: one is to use a fabric paint (including fabric markers) that works on polyester (not all fabric paints or markers do), and the other is to create your own dye iron-ons, using disperse dye. Although disperse dye is the kind of dye that is used in iDye Poly, you will probably want to use a different brand of disperse dye, one that has been packaged for use in making iron-on transfers. (Save the iDye Poly you have already purchased for another project.) iDye Poly is packaged specifically for use in dyebaths, with an inner wrapper that dissolves in water. While there are many different disperse dyes, the ones selected for use in the iDye Poly are best for use in boiling water bath. There are other lines of disperse dye that have been selected to be more suitable for use in making transfer prints. I have never used Tee Juice Markers on polyester satin, only on cotton. They do flow nicely during application, but they leave a stiffened area in the fabric, which will not drape quite as nicely as fabric which has been colored with transfer dyes. Dye-Na-Flow fabric paint flows easily, as the name implies, but it too changes the feel and drape of the fabric a little, though not as drastically as other fabric paints or as the Tee Juice Markers. It leaves only a slight feel on the fabric, if you dilute it before application. Note that all fabric paints tend to work better on natural fibers than they do on polyester; some brands will not cling to synthetic fibers at all, but even those that do work on polyester tend to look better on cotton or rayon. This is exactly the opposite of transfer dyes made from disperse dye, which look their very best on polyester satin, and make no change at all in the feel or sheen of the polyester fabric. You really do need to test whatever techniques you choose to try. You definitely want to gain a little expertise before you even approach your wedding dress to color it. It’s excellent that you have already acquired some test fabric. I was about to advise you to go to a fabric store now, to find the closest match of some fabric made of the same fiber content (100% polyester), with a similar weave, texture, color, and sheen. Buy one Tee Juice Marker for your test, or one of each color, and buy one jar of a likely color of a fabric paint whose label indicates that it will work on polyester, such as Dye-Na-Flow, and buy some disperse dye crayons. You will probably want to mail-order a different kind of polyester dye more suitable for painting your own iron-ons, which on a large scale will be the most economical and least tiring method for this project, but for your very first tests you can just buy some disperse dye crayons, either online or at the fabric store. Look for Crayola Fabric Crayons, or Dritz transfer crayons; if you see only another brand, the keys to look for are “transfer crayons” and instructions to use only on synthetic fabrics. 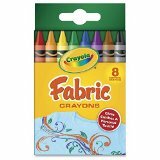 (Do not confuse these transfer crayons with the ordinary wax crayons they look just like! Ordinary crayons do not work for this at all.) You should also buy some large white paper, either on a roll or in big sheets, such as a very large inexpensive pad of blank newsprint paper, at least eighteen inches by twenty-four inches in size, the type that art students use in life drawing class; if you don’t find this elsewhere, go to an art supply store, or even a store that sells supplies for packing for moving. The advantage of making your own disperse dye iron-ons is that the dye can look very good, with absolutely brilliant colors, better than any paint or marker. With iron-ons, as opposed to painting directly on the fabric and using a heat gun to set, you also have the advantage of not having any unbound dye sitting on the surface of the fabric. The only dye that transfers to the fabric is properly absorbed into it. To create your iron-ons, you can use the transfer crayons to draw onto paper, or you can mix up your own paint using disperse transfer dye. (Some disperse dyes are better for transferring than others are, so it is best to buy disperse dyes that are specifically labeled as transfer dyes.) The colors will look dull on paper, but don’t worry; they get far more brilliant when they are transferred to the polyester fabric. Let the paint dry, if that’s what you’re using, or brush any crumbs of the transfer crayons off of the paper, then place the paper against the fabric with the colored side touching it, and cover with more paper to protect your iron (or follow the directions you find on the transfer crayon package). For your tests you can simply work on an ironing board that has been protected with many layers of newspaper or scrap fabric, keeping in mind that transfer dye can easily penetrate through several layers. Using a hot clothing iron, follow the instructions for pressing the paper so that the dye transfers. If you can get access to a t-shirt press it would work even better than a clothes iron, since it is bigger. You can reuse the same piece of paper several times, with the color intensity getting dimmer with each pass, or, if you choose, you can simply reapply the color in the same places on the paper before reusing the paper to create more of the same design. This can really save a lot of effort for a design which has as much repetition as yours will. Coloring enough paper for a large dress with transfer crayons would be tiring, plus the final effect, while wonderfully brilliant, really is reminiscent of crayon coloring. This can be great but only if that’s the effect you are going for. The best way to do large expanses of fabric is to make your own disperse dye paint, and paint it onto the paper. An excellent source for the dye is PRO Chemical & Dye, in Massachusetts. Look at their PRO Transperse Transfer Printing Dyes. They provide good instructions on a PDF page. This is by far the most economical alternative for decorating large amounts of polyester fabric. You can use any sort of paintbrush or applicator you like, and you can thicken your transfer dye paint to make it flow as much or as little as you want it to, on the paper, when you paint it. Remember that the dye must be completely dry before you do the heat transfer. You should test one or two Tee Juice markers on your piece of test polyester and compare the colors and textures to those you get with a small test jar of fabric paint and with transfer printing. I am afraid that doing large amounts of a full skirt with markers would be as fatiguing as doing the same with transfer crayons. Your hands will thank you for using transfer dyes you’ve made into paint, or, if you choose to go for a paint such as Dye-Na-Flow, quart-sized jars of fabric paint (you can order these from Dharma Trading Company). I recommend you plan to use the markers only for fine details after you have done the majority of your design with another material. No matter how much or how little time you may have available for this project, testing is absolutely essential. You will need to test your techniques and decide which materials you like best, before you invest a lot of effort and material in a technique that may not meet your needs. This entry was posted in dyeing polyester, transfer dye on January 11, 2016 by pburch.